Tui was formally commissioned for RNZN service on 11 September 1970, at the Brooklyn Navy Yard, New York.While the prime user of the ship was the Defence Scientific Establishment, the ship frequently worked for other institutions, such as the Universities of Auckland and Hawaii and the Department of Scientific and Industrial Research. This badge was originally suggested by the Navy Office for use by the Bird-class corvette that was to enter service in 1942 but it was never actioned. The badge was formally approved in 1953 and featured the reverse of the penny piece. When the badge was issued in 1970 the kowhai leaves and flowers were removed. HMNZS Tui was built by Christy Corporation at Sturgeon Bay, Wisconsin and taken into the United States Naval Service (USNS) as USNS Charles H. Davis [AGOR-5] in January 1963. 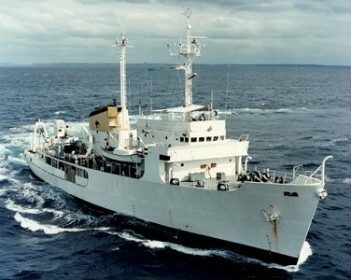 As one of the Conrad class of seven oceanographic research ships, utilized on a ‘pool basis’, Charles H. Davis had been in reserve for some years before being leased to the Royal New Zealand Navy for five years from 28 July 1970. He predecessor was scrapped in Auckland in 1970. The lease was renewed for a further five years to 1980 and again in 1979 for a further 15 years and the ship was eventually purchased for the RNZN by the government. Tui was formally commissioned for RNZN service on 11 September 1970, at the Brooklyn Navy Yard, New York. After sea trials the ship sailed for New Zealand on 24 September, via Panama and Tahiti. On arrival at Auckland on 13 November 1970 Tui underwent a refit to install the specialist scientific equipment required for its New Zealand research programme. Tui was adopted by the city of Napier and was granted the Freedom of the City. While the prime user of the ship was the Defence Scientific Establishment, the ship frequently worked for other institutions, such as the Universities of Auckland and Hawaii and the Department of Scientific and Industrial Research. Although primarily equipped for underwater acoustic research, the tasks undertaken were many and varied, including; water sampling, mapping underwater volcanoes, testing parachutes for use as sea anchors, servicing lighthouses, acoustic experiments for SOIS, servicing the RNZN Sound and Degaussing Ranges and developing anti-submarine towed arrays. In the late 1970s she took part in joint research with the RAN vessels HMAS Diamantina & Kimbla. She also worked with the United States Navy up to 1985. From a personal aspect Tui was not a comfortable ship to live in, the ship’s stability and resultant motion giving frequent concern. Another notable point was the ship’s very long range, in excess of 15,000nm, meaning that it only had to refuel about once a year. Such a range resulted in the little known fact that Tui had the largest fridges of any ship in the Navy and could stay at sea for long periods. Nevertheless it was a popular posting. Tui’s last major deployment was in 1995 as part of Operation VALERIAN. In May 1995, Jacques Chirac running for the Presidency of France promised that if elected, he would end the moratorium on testing of nuclear devices. He won the election and announced on 13 June that between September 1995 and May 1996 there would be a new series of eight tests at Mururoa Atoll. France was pursuing its status as a world power and retaining option of having an independent nuclear deterrent. The last of the underground tests had been conducted in 1991 and the moratorium instituted on 8 April 1992. Two reasons given for the resumption of testing was to verify the safety and reliability of the devices and to develop warheads with better yield-to-weight ratios. France indicated that it would be willing at the end of the testing programme to be a party to the Comprehensive Test Ban Treaty. New Zealand protested and sought, as they had in 1973, a legal avenue to prevent the tests using the International Court of Justice. The claim for an interim injunction against further French testing was filed on 21 August 1995 but the hearing would not start until 30 October well after the first tests had been conducted. It was clear that the depth of resentment to France and outrage that the testing programmes surprised both Australia and New Zealand. The United States offered to share computer modelling data from nuclear tests with France, something that was unthinkable in 1973. Despite the public outcry, Australia would not deploy a naval vessel arguing that a naval vessel should be used for naval purposes i.e. naval warfare. The New Zealand government took a different view. It part due to the political and public pressure, the government announced that a ship would be sent but out operate outside the 12-mile territorial limit. Part of its intended role would be to offer support to the flotilla of protest vessels. On 18 July Prime Minister Jim Bolger announced that there was broad agreement to send a RNZN ship to support the protest fleet. HMNZS Tui was identified as the ship to be sent to Mururoa and it was also agreed that MPs would voyage to the testing zone. The RNZN would be sending an unarmed oceanographic research ship and not a warship; a gesture intended not to antagonise the French further. On July 24 a warning order was issued to the commanding officer of Tui ‘for a 70-day deployment to the South Pacific in support of Government initiatives at Mururoa.’ Two days later the government stated that it hoped that there would be a reduction in the number of tests but felt it was a ‘very slim hope’. During this period a lot of equipment was removed off Tui in preparation for the deployment including making room for civilian passengers. On 4 August, Tui was ready for Operation VALERIAN, the name given to the operational deployment of Tui to Mururoa. At the time of the decision to send a vessel, it had been intended to put Tui into operational standby and this impacted on the navy’s budgets for that year. Chris Carter and Brian Neeson boarded the vessel for the first phase of the deployment. After a photo opportunity with Prime Minister Jim Bolger, officers from the RNZN including the commanding officer of Tui Lieutenant J.F. Campbell briefed the Peace Flotilla on her role upon arriving at Mururoa. The skippers of the protest fleet ‘were surprised that Tui would not be escorting or herding the flotilla to Mururoa.’ Tui would depart on 12 August from Auckland to ‘allow maximum media coverage.’ Before it left Princess Wharf the media circus onboard followed Helen Clark and Jim Bolger as they took morning tea with senior officers, met the ship’s company, and played up their antinuclear stance while the two MPs had photo opportunities while unpacking in their cabins. The voyage would be under the control of the RNZN with an interdepartmental ‘watchgroup’ providing guidance on the legal, political, and media aspects of the operation. Media controls were far less strict due to the technology available to the news media in 1995 than in 1983 which meant that the government had to monitor news output very carefully. As she sailed to Rarotonga the commanding officer had ‘some doubt as to the sea worthiness of the two embarked politicians.’ The satellite communications system received many calls from the media in New Zealand getting updates on seasickness of the MPs. Upon arrival in Rarotonga the Tui spent two days having fun ashore and departed on the afternoon of the 19th. At this time media representatives from Radio NZ, TVNZ, and NZPA joined the ship along with two Cook Island politicians. Tui arrived at the 12-mile territorial limit on the afternoon of Thursday 24 August. There was great excitement amongst the media representatives and politicians when a French patrol craft rendezvoused with Tui to pass along a letter. Following naval protocol was interpreted as being ‘so openly friendly’ and the commanding officer was at great pains to explain to the exited passengers that it was a normal mark of respect. The letter welcomed Tui to Mururoa and asked the RNZN to respect the right of the French navy to protect the sovereignty of this French colonial territory. The ship’s company then found itself in the middle of a ‘dogfight’ between the media representatives, the embarked politicians and the government at home. This was due in part to the delay in receiving direction from Wellington and the fact that the politicians had not been able to hand over a protest letter to the French when the patrol craft’s commanding officer visited Tui. The commanding officer of Tui in resented the way media portrayed Tui as the ‘Government’s vehicle for her inability to react to a situation.’ On 27 August Tui met up with some of the protest fleet. Media aboard the Greenpeace vessel Rainbow Warrior wished to interview the MPs on Tui causing more angst for them as they sought guidance from Wellington. Fortunately this matter was resolved and media guidelines issued to the MPs. The next day the Tui met up with another French patrol craft an a letter of protest was passed across satisfying the politicians. The French navy deployed frigates to shadow the protest fleet usually staying some two nautical miles from the yachts. When the protest fleet would gather, they would be surrounded by their French partners. The MPs at one stage went across to the protest yacht Tryptych and returned to the Tui happy that they had been the guests of the RNZN and not cooped up on a yacht. At the start of September French commandos using tear gas stormed the Rainbow Warrior II, arresting and deporting the crew when the ship entered French territorial waters. MV Greenpeace was also boarded and both ships were taken to Hao Atoll. The media and politicians pressured the commanding officer of Tui to move closer to territorial waters after the Greenpeace vessels were taken under control. They did not understand how long it would take for Tui to sail around the territorial limit to reach the area the Greenpeace vessels were before they were boarded. This was seen by the civilians as non co-operation by the RNZN. However, the Navy was following their orders and they would be interested bystanders as the protest yachts antagonised the French. On Tuesday 5 September 1995 the first device was detonated. The media contingent went into high gear and the ship’s communication circuits were flooded with calls from international media. By the end of the week the media and politicians were clambering for the Tui to return to Rarotonga. This she did and arrived back on 17 September. After reprovisioning she then departed for Mururoa this time carrying the MPs John Carter and Pete Hodgson accompanied by media representatives and civil servants. During the passage damage to the starboard main engine generator halved the speed of Tui and it would be a slow voyage to Mururoa. Tui arrived at the edge of the territorial waters on 26 September. That afternoon Tui stood by when the yacht Vega deliberately crossed the 12-mile limit and was boarded by the French and escorted to the atoll. That night there was an incident when a French Patrol craft closed up to the Tui. When the commanding officer was contacted the next day by the French navy and he explained that it was the French ship’s poor handling that gave rise to the close encounter. October 1st was a day of action. The protest was breaching the limit and the French were very active in escorting yachts out of territorial waters and boarding vessels that had launched canoes to land on the atoll. All this activity attracted the media’s attention and they transferred over to a yacht where they were discussing when the next test would be. As this discussion continued, the French detonated their second device in the afternoon. Tui did not pick up that the detonation had occurred until the media in New Zealand called them to determine if the French had tested the device. The rest of the time on station was spent relaxing as now the tests had been conducted. On 9 October Tui left the waters off Mururoa but not before the MPs passed another protest letter to the French when Tui met up with a French patrol craft. Tui then sailed for Rarotonga then home arriving to a welcome on 26 October 1995. Tui went into reserve as in 1998 was judged as been well past her economic life and was stripped and towed to Whangarei to be scuttled and used as an artificial reef for recreational divers. The post deployment report indicated that ‘from a military perspective, the mission was achieved’ but that ‘a number of difficulties that arose with the passengers could have been averted had proper vetting been conducted…’ It was also recommended that ‘passengers on a politically orientated deployment such as this one…be subject to background checks.’ But the service that Tui provided to the protest fleet was invaluable. The reports for the time Tui spent off Mururoa shows that she provided water, fuel, and medical services to the yachts. This was another example of the character, seamanship, and patience of the men the RNZN sent to monitor another nuclear test by the French. Ramesh Thakur, The Last Bang before a Total Ban: French Nuclear Testing in the Pacific Working Paper No. 159, Canberra: Australian National University Research Scholl of Pacific Studies, 1995, p. 1. ibid., p. 29. See also Sarah Boyd, ‘Parties unite to condemn French tests’, The Evening Post 18 July 1995, p. 1. Ruth Laugesen, ‘Navy may join protest yachts’, The Dominion 14 July 1995, p. 1. Sarah Boyd, ‘Parties unite to condemn French tests’, The Evening Post 18 July 1995, p. 1. HMNZS Tui Report of Proceedings for July 1995, p. 3. ‘Hope still held for test reduction’ The Dominion 26 July 1995, p. 2. HMNZS Tui Report of Proceedings August 1995, p. 1. HMNZS Tui Report of Proceedings August 1995, p. 3. ibid., p. 5. The letter is attached to the report. HMNZS Tui Report of Proceedings September 1995, p. 1. HMNZS Tui Report of Proceedings October 1995, p. 2. ibid., p. 6. Tui spent 75 days at sea while on Operation VALERIAN.